If You *Love* Being On Instagram, You Need To Read This NOW! A lot of us girls live a considerable portion of our lives on social media, don’t we? And there's nothing wrong with that - it’s not just about the instant validation, being flooded with likes and shares. We really enjoy sharing our lives with other people and getting to know more about them as well! And we do that by sharing our experiences through photos and videos on platforms like Instagram. The best part about Instagram is that they are absolutely committed to making our lives safer on the social media network. 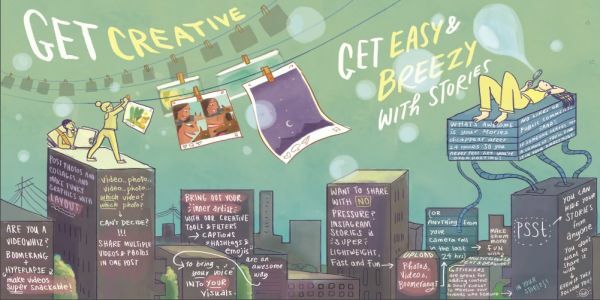 Here’s a deep dive into Insta Gyaan – an awesome and cool zine made by Instagram especially for India! If you’re on Instagram, you NEED to read this, girls! Your Instagram posts are an extension of your personality, a curation of memories that make your life awesome. And so, of course, you get to decide who can see it and who can’t. You can make your profile private so that only your followers can see your posts, and remove followers from your private account. But let’s say you want a public profile – there are ways to be private while being public too! Blocking specific people, and hiding your stories from them are two super easy ways of doing that. Instagram is a great place to showcase your creativity and passions, as we all know already. If you’re a fabulous foodie or chronicling the adventures of your adorable cats, that’s great too! 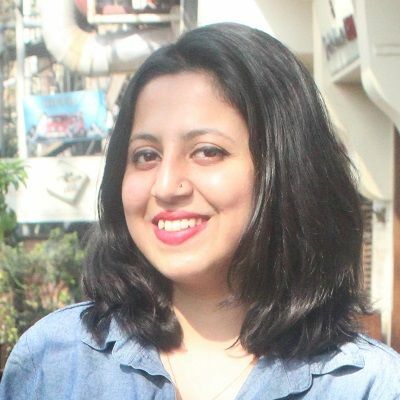 People often love following feeds with themes, so you don’t always have to post photos of yourself and your personal moments to be active on this platform. But if that’s what you want to do, you should feel comfortable expressing yourself! People will come to your feed and engage with it because it’s awesome! You can hide your stories from as many of your followers as you like! Isn’t that great? And for those special pictures you just want to share with your besties, you can send them a direct message instead. Easy-peasy! 4. How much personal information is too much? As much as we would like to believe it, not everyone operates on social media with the best of intentions. So you should definitely try and avoid giving out information like your phone number, your address and your location. You don’t have to share that with the rest of the world because your safety comes first! And if you are at a concert, a restaurant or any other public venue, it’s not a bad idea to tag yourself at that location only once you’ve left. Yes, ladies, you can turn off comments on any of your posts. Isn’t that awesome? We all know how judgy people can get at times - yes, even the ones we often socialize with. So just don't give them a chance to ruin your moment! There is also an option to weed out, delete and even report abusive comments. Or you could use custom keyword filter to control the comments that you see. The newest offensive comment filter automatically hides offensive comments from your feed. All you have to do is turn it on! Their motto? Positive vibes only! The app has an amazing security feature called two-factor authentication. Once you enable it through your settings, every time you log in from an unknown device you'll be asked to enter an SMS security code or backup code in addition to your username and password. A one-time password (OTP) will be sent your registered phone number which will give you access to your Instagram account. Doesn't knowing that make you feel so much better already?! As an active user of Instagram, you also have an important part to play in making the platform a positive community. 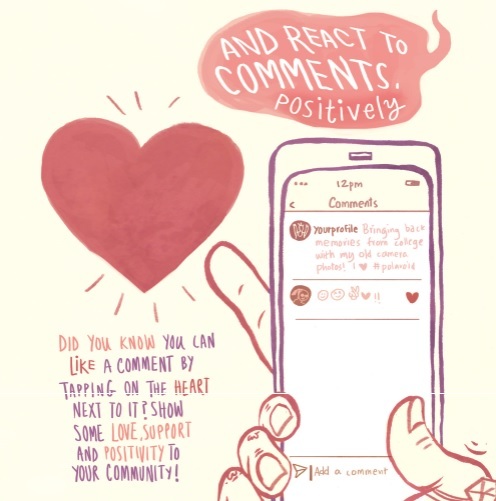 React to others’ post with positivity, tap the heart button to like a post or comment and comment to show your support and appreciation. While social media is the place to express yourself, it’s always nice to send out some love! Remember, what goes around comes around! 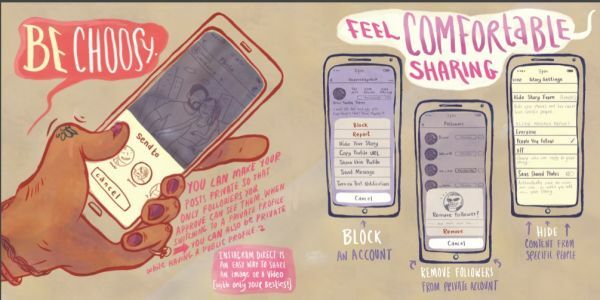 If you notice that one of your friends is struggling with something, you can anonymously report it to Instagram, especially if you are unsure of how to reach out to your friend. 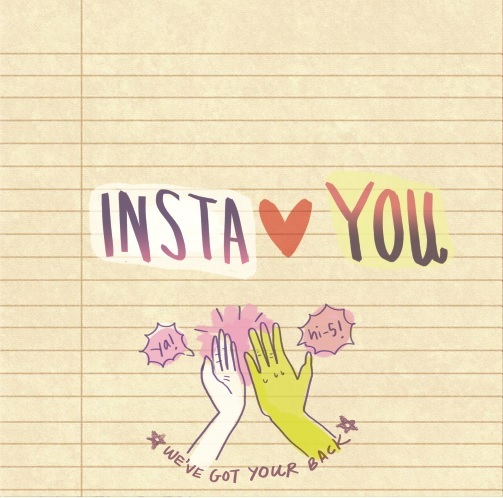 Instagram’s tools aim to provide relevant resources for both the person in distress, and the friends and family who want to help. If you believe that someone you care about may be thinking about injuring themselves, you can report it anonymously, and your friend will be connected to local organisations that offer help. There are teams working 24 hours a day, seven days a week, around the world to review these reports. All you need to do is take the first step! If someone has posted something which could be considered as sensitive content or spam, Instagram will blur it out with a warning and you can decide if you wish to view that post. It's totally your call! If you have any questions or want to learn more, make sure to visit www.instagram-together.com, a microsite dedicated to all the things that help keep Instagram safe, supportive and positive! Go on, don't be shy! Download a copy of this awesome zine, illustrated by Kaveri Gopalakrishnan, here and grab your physical copy at the next POPxo event! *This post is in collaboration with Instagram.